Connecting the Threads—Overalls to Art: The H.W. Carter & Sons Factory, a 37-minute-long documentary film focusing on the history of work in AVA’s own historic building has received a national award. Co-produced by Historic New England, CATV and AVA, and premiered here in January 2013, the documentary is the recipient of a 2013 Leadership in History Award from the American Association for State and Local History. This awards program, initiated in 1945, is the most prestigious national recognition of achievement in the preservation and interpretation of local, state and regional history. 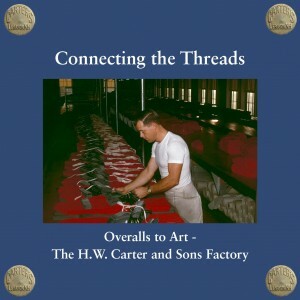 Click here to purchase a DVD’s of Connecting the Threads—Overalls to Art: The H.W. Carter & Sons Factory. Click here to watch Connecting the Threads—Overalls to Art: The H.W. Carter & Sons Factory.